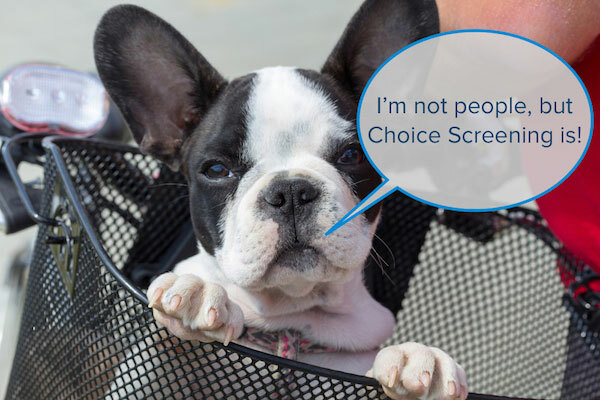 In early 2016, we launched our new website – same address (choicescreening.com), totally different experience! What does "Talk to a Human" mean to us? A whole lot! For starters, it’s literal. When you call Choice Screening, you actually reach a human being when the phone stops ringing because, let’s face it, phone trees exist to benefit the corporation. Yes, they help filter calls to the right department so accounting doesn’t get bombarded with technical support, but that’s assuming you didn’t go through a half dozen menus to get there in the first place! It means you’re never just a number or only the next call in the queue. Right from the start, we like to give you our direct number. This way, you always have someone to contact – you can get to know us and we can get to know you! It helps us provide you with better service all along the way. Talk to a Human also means that we’re human and so are you – and we realize that! A lot of business vendors forget that they’re not selling to a corporate entity, they’re selling to actual people who are acting on behalf of the entity. Corporations are a concept; they are the shell that exists because of the people inside. Corporations don’t have feelings or opinions. They’re not frustrated with old vendors and they’re not looking for solutions to solve hiring problems. Because we know you are human, we focus on building relationships and care about living up to your expectation. Background screening can seem impersonal and dry (especially if you’re not subscribing to our awesome blog or following us on Twitter and LinkedIn), but it doesn’t have to be! We’re really, really committed to you – making you happy; making your team happy. And, we’re especially interested in giving you quality and reliable background screening reports so you can make a good decision. Have you missed us or do you want to meet us?